August is National Back to School Month! As summer vacation gives way to the beginning of a new school year, families with children are gearing up to head back to school. Many parents use the month of August to prepare for the school year and cross off the many tasks associated with the start of school such as purchasing school supplies, organizing family schedules, shopping for new clothes, and getting back into a routine. Returning to school can be both exciting and stressful. Parents who arm themselves and their children with knowledge about what to do to prepare will help alleviate that stress. Parents play a key role in setting kids up for success. They can influence how their children feel about starting back to school and can have an effect on their child’s achievement throughout the year. Establish a routine. Young children thrive on predictability and repetition. When children have an idea about what’s going to happen next, anxiety is minimized, and they can relax, play, and explore. Two to four weeks before school starts, have children practice getting back into the rhythm of their daily school routine. You can do this by having them wake up at the same time every day and going to bed at a certain time. About a week before school starts, plan a few outside activities where your child will have to leave and come home around the same time as they would if they were in school. This will help them be rested and ready for the big day. Set a sleep schedule. A good night’s sleep is key for a successful school day. Preschoolers need 11-12 hours of sleep per night, school-age children need at least 10 hours, while teens need 9-10 hours. Talk about school. Back to school is exciting, but there is also a certain amount of anxiety combined with that excitement. Listen to your child and answer any questions he may have. Show excitement about the opportunities for learning new things in the upcoming year. Check out the school and meet the teacher. Even if your child has been at the school for years, he will have a new teacher and classroom. Try your best to bring him to any orientations or open houses that are hosted. This will give your child the opportunity to meet his teacher ahead of time. By knowing his room and his teacher beforehand, this should ease some of the beginning of the year anxieties. Yearly checkup and medical records. Get your child’s yearly checkup before school starts. Ensure all required vaccinations are up to date. Provide teachers with a complete list of any medical concerns or medications they will need to know about your child, including allergies. Make sure all emergency contacts are updated and notified they are on the emergency call list. Review and complete school packets. 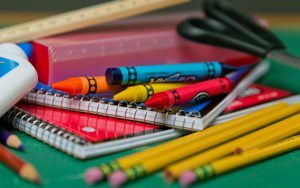 For most parents, schools send home a packet filled with information regarding their child’s new teacher, important dates to remember, emergency forms, permission slips, and other information. Ensure that you read through this information carefully, put all important dates on the calendar, and submit required documentation. Post a family calendar. Keep a master calendar with everyone’s assignments, practices, and appointments in one place. Post the calendar in an area where everyone can see it such as the refrigerator, so kids can see the plans for the morning, afternoon, and evening. Let them take part in writing items on the calendar such as class trips or picture days. Back-to-school shopping. Pick a date to go school shopping with your children. This date should be set and organized some time in advance to have a relaxed shopping experience. Choosing their own school supplies, clothes, a backpack or lunchboxes will engage children to take part in the activity and may increase their excitement about going back to school and using all the new things. Fuel up for breakfast. Studies show that children who eat a nutritious breakfast function better. In general, kids who eat breakfast have more energy and do better in school. You can help boost your child’s attention span, concentration, and memory by providing breakfast foods that are rich in whole grains, fiber, and protein, as well as low in added sugar. Promote parent engagement. ChildWatch® offers a parent portal so that centers can keep families involved and maintain a partnership between home and center. Parents can view the center’s events calendar, their child’s daily activities, and can send and receive notifications via email or text through the messaging feature. Parents and teachers are on the same team. Teachers know that you love your children and they love them too! Trust your teachers and support them so that they can do their best for your child. Teachers and parents both want to see children have a successful school year, and the only way to make that happen is by working together. Back-to-school season can be exciting, but also emotional and stressful. The more you eliminate the mystery from your child’s everyday routine, the better they’ll handle the first day of school and beyond.